Ahoy Maties! Become the Queen of the High Seas in this fashionable costume. You will be the ruler of your pirate crew with this outfit on. The costume includes a vest with attached sleeves, a fun skirt, belt with buckle, and a head tie that completes the look. 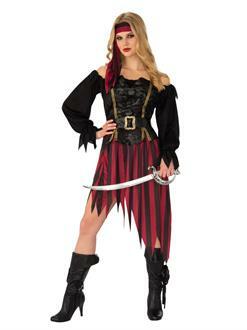 Show the seas you are not to be messed with and all the other pirates that you have the most stylish look!